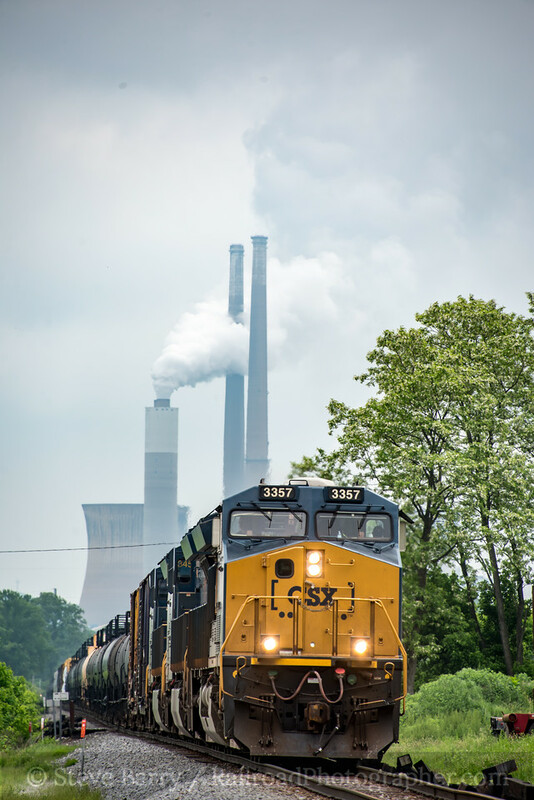 CSX Transportation has a very scenic line that runs down the west side of West Virginia along the Ohio River. 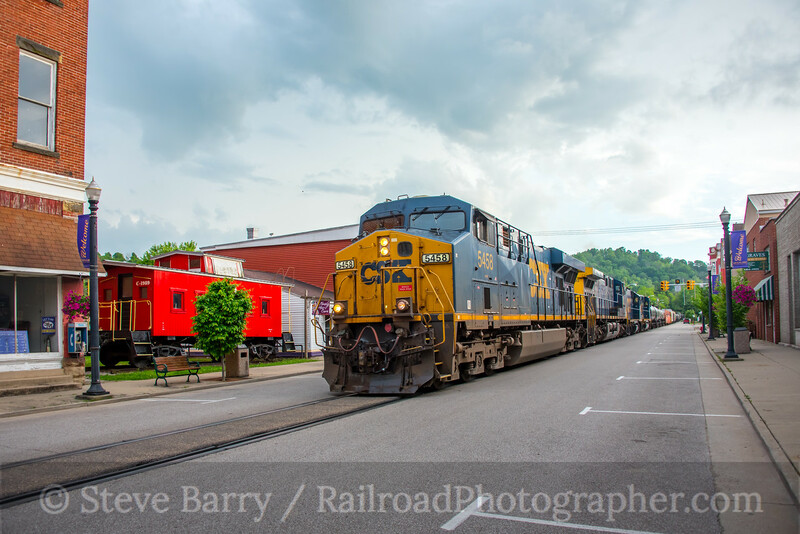 Trains come from Catlettsburg, Ky., on the west (south) end of the line and follow the river up through Parkersburg, W.Va., and into the small yard at New Martinsville before striking east into the mountains heading for Clarksburg. 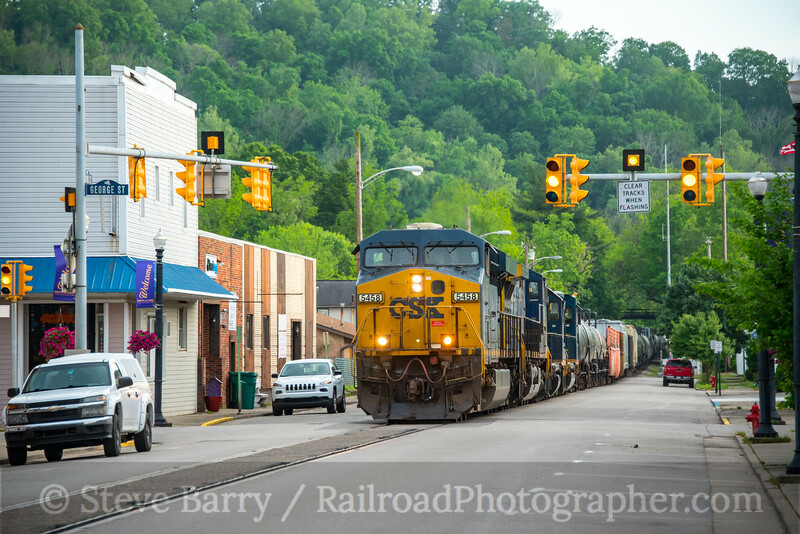 The photographic jewel of the line is St. Marys, W.Va., located about halfway between Parkersburg and New Martinsville, where trains take to the street for several blocks. 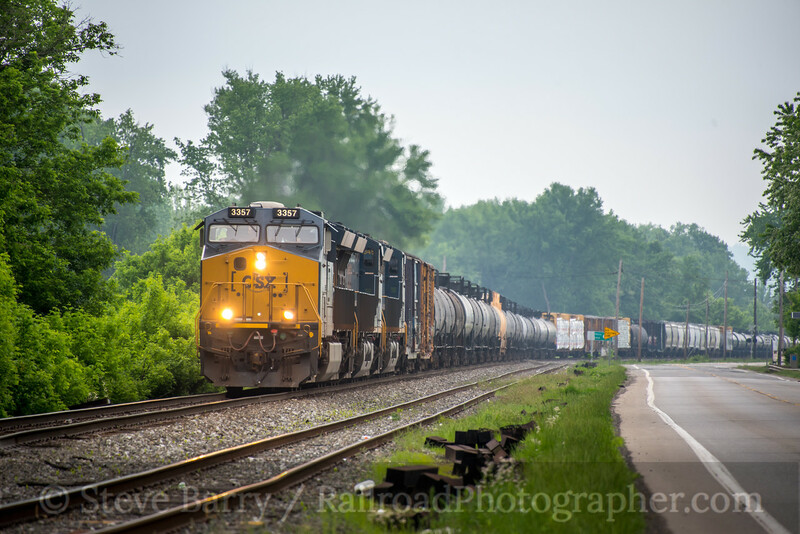 Unfortunately, the line sees very little traffic; there is only one scheduled train each way each day over the line, along with unit train extras such as coal. Even the scheduled train's times can vary wildly, making photographing the line a crap shoot. Roads follow the tracks closely from around Waverly to New Martinsville, and there are few places where a train can sneak by you, so unless you have some insider information the best strategy is probably follow the tracks east (north) from Waverly and hope you encounter a westbound along the way. 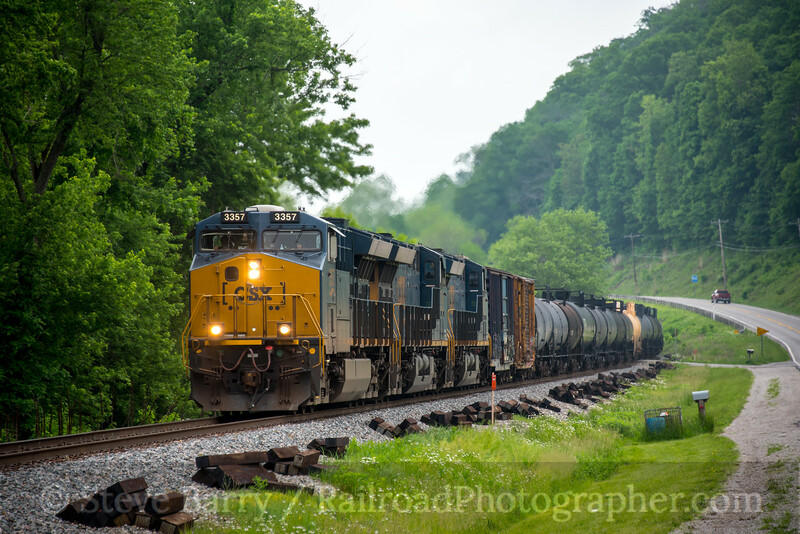 This was the case on May 20, 2018, when I drove toward New Martinsville and encountered a westbound train west of Sistersville. The chase was on, and the next stop was at a not-so-friendly house (haunted, perhaps) in Friendly. Maybe Casper the Friendly Ghost lives there. 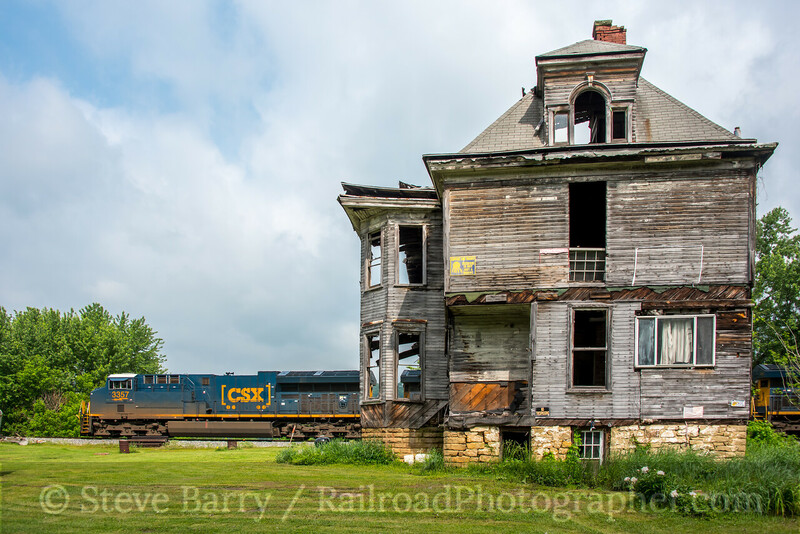 Continuing the chase, our next photo opportunity is at the west end of the siding at Ben's Run. Despite the lack of trains on the line, meets here are not entirely unheard of, as it is one the few places two trains can pass. There's time to grab one more shot before heading into St. Marys for the street running. 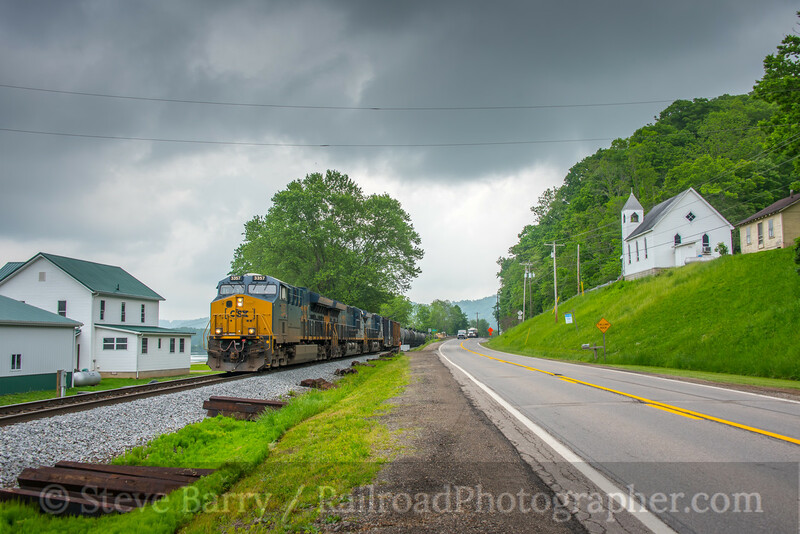 We stop just a few miles outside of St. Marys to get the train passing the Raven Rock Baptist Church. Our chase finally brings us to Second Street in St. Marys. 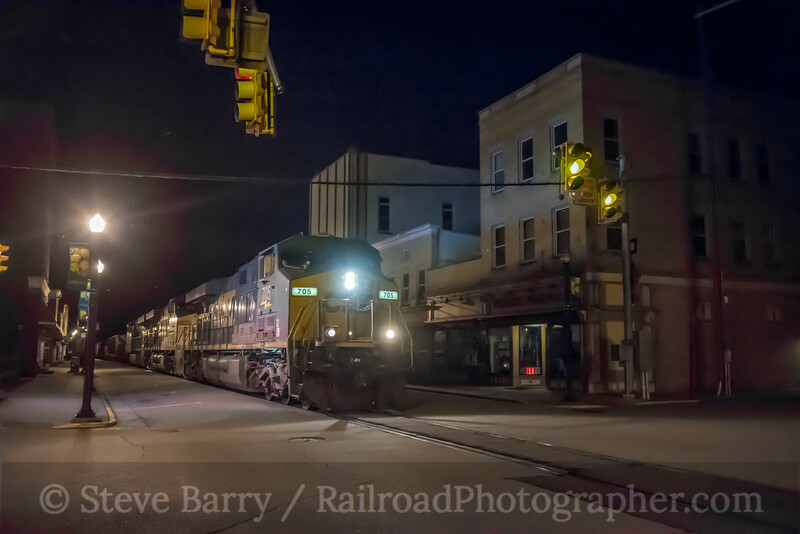 Most of the cross streets are controlled by traffic lights, and when a train arrives in town all the lights flash yellow simultaneously down Second Street while flashing red for the cross streets. Our chase ends west of St. Marys at Willow Island, with the First Energy Pleasants Power Station in the background. 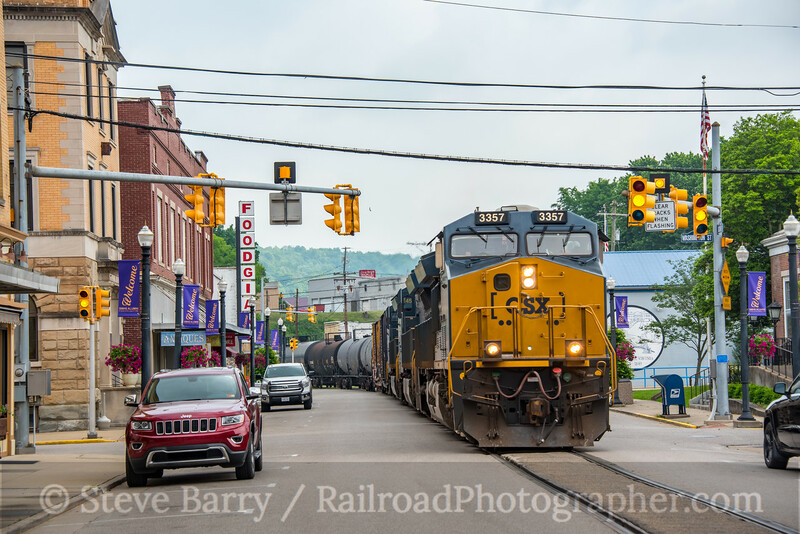 We leave our train here as it makes its way to Parkersburg. What I didn't know at the time is the train will encounter a short stretch of median running in Williamstown, just a few miles further west. Those shots will have to wait for the next chase! In the meantime, I've done a little more shooting at St. Marys, and we'll finish with a few other scenes from there. The top photo in this post is of an eastbound taken the day before the chase related above on May 19, 2018. Below is a photo taken at night on April 4, 2018. 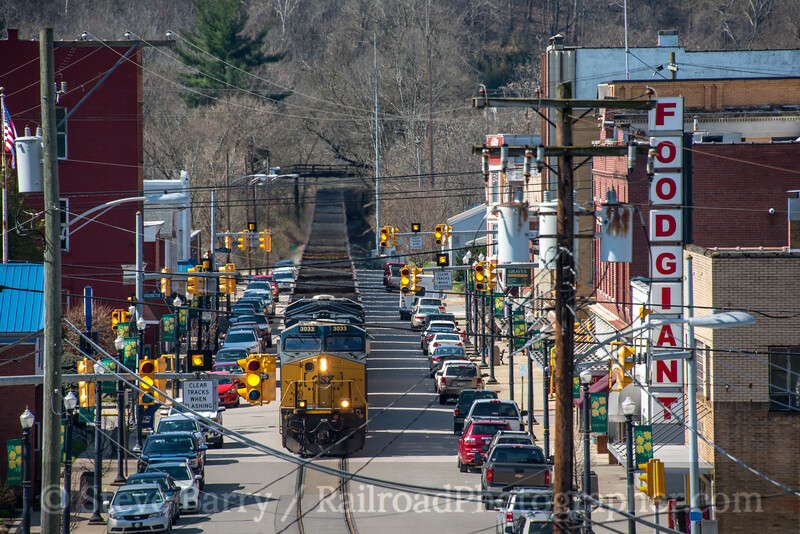 A hillside on the east end of town provides a nice perch to shoot a train coming through downtown. The tricky part is to fire the shutter with the least amount of wires cluttering the front of the unit and to get the yellow flashing lights when they are lit! There is also a former Baltimore & Ohio caboose on display in town. Small stores and a nice restaurant are also present. The wait can be long in St. Mary's, but it can be pleasant until a train arrives.